LIVE OAK, Calif.--(BUSINESS WIRE)--Sep. 4, 2018-- KB Home (NYSE: KBH) today announced the grand opening of Pennington Ranch, an enclave of one- and two-story new homes in the beautiful city of Live Oak. Located in northern Sutter County, Live Oak offers an exquisite blend of serene small town living with convenience to local employment centers in Roseville, Rocklin, Lincoln and downtown Sacramento. Surrounded by idyllic farmland, orchards and buttes along the Highway 99 corridor between Yuba City and Chico, KB Home’s Pennington Ranch offers easy access to San Francisco, Lake Tahoe, and Sacramento. Residents can enjoy nearby Feather River and local parks that provide abundant recreational opportunities. Pennington Ranch is also close to desirable schools and several colleges, including Butte College in Oroville, California State University, Chico, Sierra College in Rocklin and Yuba College in Marysville. KB Home will host a grand opening celebration at Pennington Ranch on Saturday, September 8, from 11:00 a.m. to 2:00 p.m., during which attendees may tour the elegantly-appointed model homes. 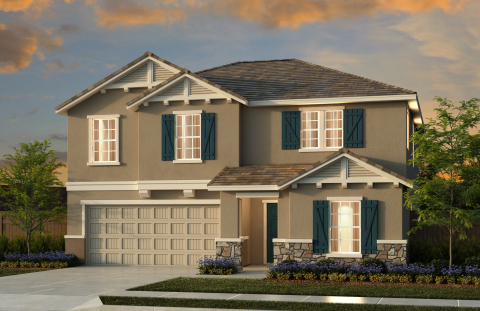 At Pennington Ranch, KB Home will be constructing 97 one- and two-story homes and offering three distinct floor plans. With up to five bedrooms and three bathrooms and ranging in size from 1,718 to 2,376 square feet, the KB homes at Pennington Ranch feature such desirable design characteristics as spacious dens or loft spaces, master walk-in closets, and dedicated laundry rooms. Pricing begins in the mid-$200,000s. The homes at Pennington Ranch will be built to current ENERGY STAR® guidelines and include WaterSense® labeled faucets and fixtures, meaning they are designed to be more energy- and water-efficient than most typical new and resale homes available in the area. These energy- and water-saving features are estimated to save KB homebuyers between $1,620 to $1,848 a year in utility costs, depending on the floor plan. As part of KB Home’s distinct homebuilding process, homebuyers may select their lot, floor plan, and personalize many aspects of their new home to suit their budget and preferences. Expert design consultants are available to guide KB homebuyers through every aspect of the design process at the KB Home Design Studio, a retail-like showroom where they may select from a plethora of design and décor choices including flooring, countertops, cabinets, lighting, appliances and window coverings. The Pennington Ranch sales office is located at 9963 Luther Road in Live Oak. The sales office is open Thursdays through Tuesdays from 10:00 a.m. to 6:00 p.m. and on Wednesdays from 2:00 p.m. to 6:00 p.m. For more information about Pennington Ranch or KB Home’s other Sacramento-area new home neighborhoods, visit www.kbhome.com or call 888-KB-HOMES.